Recruitment. Online application for this DSSSB Pharmacist jobs will be accepted through http://dssbonline.gov.in from 01-11-2017 to 21-11-2017. Application are received through online only for this DSSSB Pharmacist Jobs Recruitment 2017. Candidates will be selected through written test for these DSSSB Homeopathic Pharmacist jobs of Delhi Ayush Department. Exam Pattern, qualifications, category wise vacancy details and other information is given below. 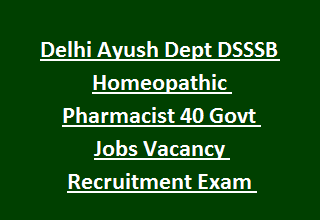 There are total 40 Pharmacist jobs in this Delhi Ayush Department recruitment through DSSSB. Upper age limit is 27 years. Age limits for reserved candidates as per the govt norms. Must have qualified 10+2 with Science Subject and Diploma in Homoeopathy pharmacy of not less than two years from recognized university or govt board or institute. Selected Candidates will received the pay scale of 5200-20200 + Grade Pay 2800 monthly. Examination fee is Rs.100/- and female candidates, SC/ST, PH and Ex Serviceman no fee. Candidates will be selected based their marks in written examination. Based on merit in tier 1 written exam marks and interview only candidates will be selected. Written Exam will consist of single paper. Total 200 questions will be given and each question carries one mark. 100 marks question will be given from the general concepts and 100 from the subject. B). Objective type multiple choice questions for 100 marks from the Subject Oriented. Only online applications will be accepted for this Delhi SSSB Homeopathic Pharmacist Jobs of Ayush Department. Online application submission last date is 21-11-2017. Submit the application form through official website of DSSSB @www.dsssbonline.gov.in.